As we reported earlier, the team left for Korea a week before the tournament to allow the athletes to adapt and reach their top shape for the competition. We should note that this was the first time the team traveled with 11 fighters, four coaches, two referees and one interpreter. It was amazing to see the respect shown by Koreans towards the Russian athletes. The team was greeted in the airport by the president of the Korean Sambo Federation, Mr. Moon. Our guys were put up in a five-star Imperial Palace Hotel (which is surprising, since recently even Pride, one of the most prestigious fighting organizations, has not been providing fighters with such comfortable accommodations). Korean Sambo Federation took care of Russian fighters' training needs as well, and provided them with a full gym. In short, the care and attention of the Korean colleagues was seen every step of the way. Now, let’s turn our attention to the competition and the preparation work. To cut a long story short, the first day after arrival was spent on adaptation to the new environment. The next two days were spent in strict training. The third day was the so called “sauna day” (Russian fighters were quite fond of the Korean sauna). Thursday and Friday were spent in competition-specific preparation. Everything our guys were doing was diligently filmed by a Korean television crew. The tournament itself was held on Saturday, January 20th. Considering the fact that this was the first show of its kind in Korea, the spectators gave rather high marks to the way the show was managed. The laser show, as well as the background music and the percussion show impressed the audience. or some other reason, the Russian took some time to get in gear. Even his obvious lead in the third round did not change the judges’ minds, and the Korean athlete was declared a winner. 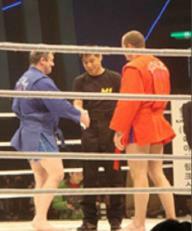 Eric Ovanov (78 Kg) and Choi Seung Phil (78 Kg) were the second pair invited to the ring. This was one of the several short fights of teh evening. Eric was initially losing the fight standing, but then he was able to take the fight to the ground and finished it with an arm lock. Then, accompanied by loud ovation, the ladies, Yulia Berezikova and Jin Song-Lee, entered the ring. Yulia dominated the stand-up and did not let her judoka opponent to take the fight to the ground. The referee stopped the bout before the end of the first round due to the obvious lead by the Russian (TKO). to take his opponent down in the third round. The judges’ decision went to Malyutin. Dmitri Samoilov graduated from the Alexander Nevsky Junior Sports Club in Stary Oskol under coach Voronov (Voronov trained Fedor since middle school - CF). During his match with You Jung Young (82 Kg), Dmitri fought well standing up and took his opponent down several times. In the third round, when he started to, as they say, finish his opponent with strikes on the ground, the opponent’s second threw in a towel (TKO). The fight between Arman Gambarian and Sul Bo-Kyung did not last long. The Korean attempted to attack Arman, but our fighter did not give his opponent any chances to continue the attack, took the fight to the ground and finished it with an armlock. By the way, the referee did not see that the Korean was signaling with his arms and legs that he is giving up, which led to a serious damage to the health of Sul Bo-Kyung (85 Kg). The athlete’s arm was seriously damaged. The Sambo demonstration by Fedor Emelianenko and his coach, Vladimir Voronov, stirred the spectators’ emotions. A couple of impressive throws, as well as the technique itself, mesmerized the audience. After the demonstration, Fedor joined the commentators’ table and tried his hand at commentating. So, Fedor’s fans were able to observe him in two different roles in one night. After the break, Amar Suloev faced Kim Hoon. Amar connected multiple times with a low kick, rendering the Korean athlete’s leg inactive. Then he added arm strikes and won in the first round (TKO). Michael Zayats also finished his fight swiftly by submitting Kim Jin-O with an arm lock in the first round. When it came down to the fight between Kirill Sidelnikov and Shin Dong-Woo, our athlete gave his team a reason to worry for a second after missing a punch to the head in the very beginning of the match. Kirill was able to immediately collect himself, and answered with a swift attack, kicking his opponent in the head. After knocking his opponent down, Kirill was able to finish him with strikes on the ground, winning via TKO in the first minute of the match. Sergey Kaznovskiy and Hwang Hyun-Sung looked rather unusual facing each other in the ring. The powerful Russian and the miniature opponent from the Korean team exchanged pleasantries by taking turns at repeatedly striking each other… The judges recognized Hwang Hyun-Sung’s desire for victory by giving him the decision. Judges also decided the winner in the next bout, in which Roman Zentsov bettered Lee Sang-Su. Roman started the first round well by knocking his opponent down, but wasn’t able to muster enough pressure to finish the fight. The match was interrupted due to a cut on the Korean athlete. Once the fight was restarted, Roman threw a low lick and damaged his foot. After that point the fight became rather tedious. The injury did not let Roman finish the fight, and the bout went to a decision. 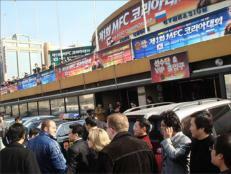 We should mention that representatives from the Russian embassy in Korea attended the tournament. After the tournament, all of the participants were invited to a celebratory dinner. Our team was followed everywhere by crowds of fans of no-holds-barred fighting. Congratulations to the Russian team! They proved, once again, that Russia has something to be proud of!